The price of each bottle is determined by the vintage and the place it is produced. Depending on the weather when the grapes are ripening and being picked will determine whether a vintage is good or not. 1944 Underrated vintage the best still drinkable. 1945 One of the greatest vintages of the century. 1962 Another amazing vintage. Ready for drinking. 1964 Great for Pomorol, St Emilion and Graves who harvested before the rains. Ready for drinking. 1966 Best vintage since 1961. Ready for drinking. 1975 Paulliac and Pomorol most successful. A highly touted vintage. Drink now or cellar. 1976 A good vintage. St Julian, Paulliac, St Estephe and Margaux the most successful vineyards producing soft fruity drinking. 1978 Excellent red wine vintage. Fully mature. 1980 Lots of supple wines produced. Ready for drinking. 1981 A good vintage. Less intense wines produced. Ready for drinking. 1982 A wonderful red vintage, with fat ripe juicy wines. The wines are drinking deliciously now, but will keep. 1983 Average vintage. Quality was less uniform than in 1982, and the best wines are in Margaux. 1985 Another fine vintage. The wines are beautifully balanced and drinking well now. 1986 A good vintage with a good concentration of fruit. 1987 A very drinkable vintage. Drink up now. 1988 A good vintage with wonderfully ripe St-Emilions and Pomerols, drink or cellar..
1989 Wonderful Medoc and good Pomorols and St - Emilions. Drink or cellar. 1995 A good vintage, red wines of charm and structure produced. 1996 A good not a great vintage. Not ready for Drinking. 1997 Quite good vintage. Not ready for Drinking. 1998 Variable vintage, Pomerols and St Emilions the best. Not ready for Drinking. 1999 Quite good vintage. Not ready for Drinking. 2000 Excellent vintage. Not ready for Drinking. 2003 Excellent vintage. Best in St. Julien/Pauillac/ St. Estephe. 2009 Excellent vintage. Possible legendary vintage. 2010 Excellent vintage. Possible legendary vintage. A good white vintage does not mean a good red vintage. Below is a table to assist you choosing the perfect gift. 1985 A fine vintage, with reds that are drinking well now, Fine for whites, too, including Chablis. Ready for drinking. 1986 The reds are showing good perfume, while the whites, except Chablis, are lighter than those of 1985. Drink soon. 1988 Very good in Chablis, exceptional in Beaujolais. Ready for drinking. 1989 A rich, ripe year in both Chablis and the Côte d_Or. 1990 A great vintage throughout the region, the red wines will benefit from further bottle ageing. 1991 Quality is patchy, the result of a rainy harvest. Drink now. 1992 The whites were better than the reds. All drinking now. 1993 Reds fared better than whites, drinking now. 1995 A splendid vintage for both reds and whites. Chablis is first rate. 1996 Another fine vintage for both red and white. 1997 Another good year, making for ripe, early drinking reds, as well as some attractive whites. 1998 A variable year. The reds are generally not for the long term. The whites however fared better. 1999 Quite a good vintage. 2000 Good white vintage red’s average. 2005 Outstanding vintage for red and white Burgundy. 2006 Very good for red and white Burgundy. 2007 Good for red and very good for white Burgundy. 2008 Very good for red and white Burgundy. 2009 Outstanding vintage for red and white Burgundy. 2010 Outstanding vintage for red and very good for white Burgundy. 2011 Very good vintage for red and white Burgundy. 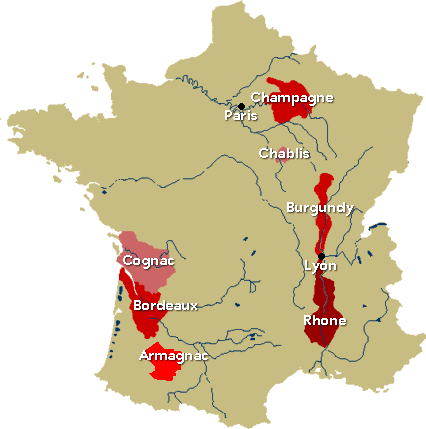 The northern Rhone contrasts with the southern part of the valley and there are differences in grape variety and climate. 1980 South better than the north. Quite good vintage. 1983 Outstanding hermitage and very good Cote Rotie produced. 1985 A fine vintage throughout the valley. 1988 A magnificent vintage in the North. Reds from the South are drinking well now. 1989 A year of ripe powerful flavours. The South is generally thought more successful than the North, but both are good. 1990 A wonderful vintage from Côte Rôtie down to Châteauneuf-du-Pape. The North was more successful than the South. Beginning to drink nicely. 1991 Generally lighter than the three previous years. Côte Rôtie in the North is the exception. 1993 Attractive whites in the North..Drink early. 1994 A very good year. 1995 A fine vintage, great wines in the North. 1998 Good in the north even better in the South. 1999 Very good vintage. The North better than the South. 2001 North a good vintage. South excellent. 2002 North a good vintage. South a very good vintage. 2003 North and South an outstanding vintage. 2004 North and South a very good vintage. 2005 North and South an outstanding vintage. 2006 North and South an outstanding vintage. 2007 North and South an outstanding vintage. 2008 North and South a very good vintage. 2009 North and South a very good vintage. 2010 North and South an outstanding vintage. 2011 North and South a very good vintage. Vintage Champagne benefits from bottle ageing, as much as ten years for the best wines. 2005 A very good vintage. 2006 A very Good vintage. 2008 A very good vintage. 2009 A very good vintage. 2011 A very good vintage. 1946 Poor Vintage Port year. 1947 Very good Vintage Port vintage. 1948 Very good Vintage Port vintage. 1949 Poor Vintage Port vintage. 1950 Good Vintage Port vintage. 1951 Poor Vintage Port vintage. 1952 Poor Vintage Port vintage. 1953 Poor Vintage Port vintage. 1954 Good Vintage Port vintage. 1955 Outstanding Vintage Port vintage. 1956 Poor Vintage Port vintage. 1957 Poor Vintage Port vintage. 1958 Good Vintage Port vintage. 1959 Poor Vintage Port vintage. 1960 Very good Vintage port vintage. 1961 Good Vintage Port vintage. 1962 Poor Vintage Port vintage. 1964 Poor Vintage Port vintage. 1965 Poor Vintage Port vintage. 1966 Good Vintage Port vintage. 1967 Average Vintage Port vintage. 1968 Poor Vintage Port vintage. 1969 Poor Vintage Port vintage. 1970 Great Vintage Port vintage. 1971 Poor Vintage Port vintage. 1972 Poor Vintage Port vintage. 1973 Poor Vintage Port vintage. 1974 Poor Vintage Port vintage. 1975 Poor Vintage Port vintage. 1976 Poor Vintage Port vintage. 1977 Brilliant Vintage Port vintage. 1978 Average Vintage Port vintage. 1979 Poor Vintage Port vintage. 1980 Good Vintage Port vintage. 1981 Poor Vintage Port vintage. 1982 Good Vintage Port vintage. 1983 Very good Vintage Port vintage. 1985 Exceptional Vintage Port vintage. 1986 Poor Vintage Port vintage. 1987 Poor Vintage Port vintage. 1988 Poor Vintage Port vintage. 1989 Poor Vintage Port vintage. 1990 Good Vintage Port vintage. 1991 Very good Vintage Port vintage. 1992 Very good Vintage Port vintage. 1993 Poor Vintage Port vintage. 1994 Outstanding Vintage Port vintage. 1995 Good Vintage Port vintage. 1996 Good Vintage Port vintage. 1997 Very good Vintage Port vintage. 1998 Good Vintage Port vintage. 1999 Good Vintage Port vintage. 2000 Excellent Vintage Port vintage. 2001 Good Vintage Port vintage. 2002 Good Vintage Port vintage. 2003 Outstanding Vintage Port vintage. 2004 Very good Vintage Port vintage. 2005 Outstanding Vintage Port vintage. 2007 Very good Vintage Port vintage. 2009 Very good Vintage Port vintage. 2011 An outstanding Vintage Port vintage. Port wine (also known as Vinho do Porto, Porto, or simply Port) is a sweet, fortified wine from the Douro Valley in the northern part of Portugal. It takes its name from the city of Oporto (Porto in Portuguese), the centre of port export and trading. Recent archeological excavations have shown evidence of wine production in the Douro valley dating back to the 3rd or 4th century AD, but the industry we know today has its origins in the mid 15th Century. However it was not until the early 18th century that the wine was fortified. The continued English involvement in the port trade can be seen in the names of many port shippers: Cockburn, Croft, Dow, Graham, Sandeman, Taylor and Warre being amongst the best known. Shippers of Dutch and German origin are also prominent, such as Niepoort and Burmester. Similar wines, often also called "Port", are produced in several other countries, notably Australia, South Africa, India and the United States. It has been produced in and around St. Augustine, Florida since the mid 16th Century. In some nations, including Canada, after a phase-in period, and the countries of the European Union, only the product from Portugal may be labeled as "port." In the United States, the Portuguese product, by Federal law pursuant to a treaty with Portugal, must be labeled "Porto" or "Vinho do Porto" for differentiation. The Instituto dos Vinhos do Douro e Porto (IVDP or Port and Douro Wine Institute) regulates the Port industry in Portugal. Of all the wine regions in the world, none has a stricter regulatory regime. Port wine is typically richer, sweeter, heavier, and possesses a higher alcohol content than most other wines. This is caused by the addition of distilled grape spirits (such as brandy) to fortify the wine and halt fermentation before all the sugar is converted to alcohol. It is commonly served after meals as a dessert wine, often with cheese. White and tawny ports are often served as an apéritif. It has an alcohol content of roughly 20%. 1) Wines that have matured in sealed tanks or bottles, with no exposure to air, and experience what is know as reductive aging. The wines very slowly take on a tawny colour, and become smoother on the palate and less tannic. 2) Wines that have matured in wooden barrels, whose permeability allows a small amount of exposure to oxygen, and experience what is known as oxidative aging. They too lose colour, but at a faster pace. They also lose volume to evaporation, leaving behind a wine that is slightly more viscous and intense. When white ports are matured for long periods, the colour darkens, eventually reaching a point where it can be hard to discern (from appearance alone) whether the original wine was red or white. Wines matured in barrels are sometimes known as 'wood ports'. Although it accounts for only about two percent of production, vintage port is the flagship wine of all Portugal. Vintage port is made entirely from the grapes of a declared vintage year. Not every year is declared a vintage in the Douro, only those when conditions are favourable to the production of a fine and lasting wine. The decision on whether or not to declare a vintage is made in the spring of the second year following the harvest. The decision to declare a vintage is made by each individual port house, often referred to as a 'shipper'. The port industry is one where reputations are hard won and easily lost, so the decision is never taken lightly. During periods of recession and war, potential 'declarations' have sometimes been missed for economic reasons. In recent years, some shippers have adopted the 'chateau' principle for declarations, declaring all but the worst years. More conventional shippers will declare, on average, about three times a decade. While it is by far the most renowned type of port, from a volume and revenue standpoint, vintage port actually makes up only a small percentage of the production of most shippers. Vintage ports are aged in barrels for a maximum of two and a half years before bottling, and generally require another ten to thirty years of aging in the bottle before reaching what is considered a proper drinking age. Since they are aged in barrels for only a short time, they retain their dark ruby colour and fresh fruit flavours. Particularly fine vintage ports can continue to gain complexity and drink wonderfully for many decades after they were bottled, and therefore can be particularly sought after and expensive wines. Single Quinta Vintage Port is vintage port produced from a particular vineyard and sometimes from a lesser "undeclared" year. However, some of the most renowned Vintage Ports are Single Quintas. Vintage port should not be confused with 'Late Bottled Vintage, which is a lesser wine (see below). The cheapest forms of Tawny Port are young wines made from a blend of red and white grapes. Unlike Tawny Reserve and Tawnies with an indication of age, they may have spent little or no time maturing in wood. Other Tawny ports are wines made from red grapes that are aged in wooden barrels, exposing them to gradual oxidation and evaporation. As a result, they gradually mellow to a golden-brown colour. The exposure to wood imparts "nutty" flavours to the wine, which is blended to match the house style. Tawny Reserve port (without an indication of age) is a basic blend of wood aged port that has spent at least seven years in barrels. Tawny with an indication of age is a blend of several vintages, with the average years "in wood" stated on the label, the official categories being 10, 20, 30 and over 40 years. Tawny ports from a single vintage are called Colheitas (pronounced col-YATE-ah, meaning harvest). Garrafeira is an intermediate style of Port that combines both the oxidative maturation of years in wood, with further reductive maturation in large glass demijohns. It is required by the IVDP that wines spend at least seven years in wood followed by at least a further eight years in glass, before bottling. In practice the times are much longer. At present, only one company, Niepoort, markets Garrafeiras. Their black demijohns, affectionately known as bon-bons, hold approximately 11 litres each. Late Bottled Vintage (often referred to simply as LBV) was originally wine that had been destined for bottling as Vintage Port, but due to lack of demand was left in the barrel for rather longer than had been planned. Over time it has become two distinct styles of wine, both of them bottled between four and six years after the vintage, but one style is fined and filtered prior to bottling while the other is not. The filtered wine has the advantage of being ready to drink without decanting, and is bottled in a stoppered bottle that can be easily resealed. However this convenience comes at a price, as the filtration process strips out much of the character of the wine. Unfiltered wines are bottled with conventional corks and need to be decanted. Recent bottlings are identified by the label wording 'Unfiltered' or 'Bottle matured' (or both). Prior to the 2002 regulations, this style was often marketed as 'Traditional', a description that is no longer permitted. Rather surprisingly, some shippers of unfiltered wine make no mention of the fact on the label. If in doubt, check the cork examine the top of the bottle to see if there is a stopper underneath the capsule; the serrated edge of a stopper is usually visible, or can be detected with your thumbnail. LBV is intended to provide some of the experience of drinking a Vintage Port but without the decade-long wait of bottle aging. To a limited extent it succeeds, as the extra years of oxidative aging in barrel does mature the wine more quickly. Typically ready to drink when released, LBV ports are the product of a single year's harvest and tend to be lighter bodied than a vintage port. Filtered LBV's do not improve significantly with age, whereas the unfiltered wines will usually be improved by a few extra years in the bottle. Since 2002, bottles that carry the words 'Bottle matured' must have enjoyed at least three years of bottle maturation prior to release. In 2002, the IVDP prohibited the use of the term "Vintage Character", as the wine had neither attribute. Crusted Port may be considered a 'poor man's vintage port'. It is a blend of port wine from several vintages, which, like Vintage Port, is bottled unfiltered, and sealed with a driven cork. Like Vintage Port it needs to be decanted before drinking. Although Crusted ports will improve with age, the blending process is intended to make these wines approachable at a much younger age. The date on a Crusted Port bottle refers to the bottling date, not the year the grapes were grown. Ruby port is the cheapest and most extensively produced type of port. After fermentation it is stored in tanks made of concrete or stainless steel to prevent oxidative aging, and preserve its rich claret colour. The wine is usually blended to match the style of the brand it is to be sold as. The wine is fined and cold filtered prior to bottling, and does not generally improve with age. White port is made from white grapes, and should always be served cool or cold. It can be used as the basis for a cocktail, or served on its own. It is particularly agreeable on a hot summer's evening. Although some brands of white port are described as 'dry', they are, like all ports, relatively sweet. In general, the answer can be found by looking at the type of cork used to seal the bottle in question. If the bottle has been sealed with a stopper; that is to say a cork that has a plastic cap, which can be removed without a corkscrew; then the answer is normally no. However, decanting will not hurt such wines, and some Tawnies are improved by the small amount of aeration that occurs during decanting. If the bottle has been sealed by a driven cork, that is to say a conventional wine cork that has to be removed with a corkscrew, then the answer is yes. A decanter, large enough to hold the entire contents of the bottle to be decanted. If the decanter does not have a stopper, you will need a piece of cling film to cover the top after decanting. A funnel, with a small enough spout to fit into the top of your decanter. Special funnels are manufactured for the purpose, which come complete with a metal gauze to catch lumps of sediment. A bottle of cheap ruby port, in addition to the bottle you want to decant. This is for the final priming rinse of your decanter. A corkscrew, preferably with an open spiral. Simple, traditional corkscrews often give better results than levered mechanical contraptions, particularly if the bottle is very old. However, if the bottle is young, the cork may be very tight, and a levered corkscrew desirable. A small piece of catering grade cheesecloth if your funnel does not have a gauze screen. If this proves difficult to obtain, a new nylon stocking also works very well! Although bottles are often decanted at short notice to little detriment, the following steps will ensure the best results, and least wastage. Decide how much time you are going to leave the wine in the decanter before drinking.Vintage Port takes time to compose itself after decanting, and there can be some off notes in the bouquet that are noticeable soon after decanting, but later disappear.As a rule of thumb, wines under 25 years of age are best left for 24 hours, those aged 25 to 40 years for 12 hours, and those aged 40 to 50 years for 6 hours. Older bottles need even less time a 1908 bottle decanted in 2006 was judged to have been at its best after just 2 hours. A day before decanting, remove the capsule and clean the neck and top of the bottle. Then stand the bottle upright where it will not be disturbed. This allows the sediment to sink to the bottom, and minimises wastage. Clean your decanter and rinse it well. A musty decanter can be the ruin of a good port! Finally, just before you decant, put a small shot of your Ruby Port into the decanter and spin it round with the stopper in place so that the glass is primed, and any remaining dampness and traces of detergents are removed. This should then be drained out and disposed of. Take the bottle to be decanted, and keeping it upright to avoid disturbing the sediment, run your corkscrew through the cork.With a bottle to be decanted, it does not matter much if the corkscrew protrudes through the base of the cork, and as old Port corks often break as they are removed, it is common practice to run the corkscrew to its fullest extent. Gently take the strain, and endeavour to remove the cork without jerking the bottle. If the cork breaks, it may be possible to tease out the remaining fragment. If not, push the remains down into the bottle and decant past them. Place your funnel in the top of the decanter, and make sure that you will not be disturbed for a couple of minutes. Pick the bottle to be decanted up with both hands, and gently and slowly pour the contents into the funnel in a single action. Under no circumstances should you right the bottle mid way through, or the sediment will be disturbed. As you come close to the end of the bottle, bend down and study the trickle of wine as it leaves the bottle. As soon as you see cloudiness or small lumps appear, stop decanting. Remove the funnel and place the stopper back in the decanter. The job is done. The remaining dregs in the bottle are entirely wholesome, and are often used to make gravy. As explained above, Vintage Port takes a little time to show it's best after decanting. Thereafter, the wine will very slowly deteriorate. A decanter should always be finished within seven days. Red port can be made from many types of grapes (castas), but the main ones are Tinta Barroca, Tinta Cão, Tinta Roriz (Tempranillo), Touriga Francesa, and Touriga Nacional. White ports are produced the same way as red ports, except that they use white grapes Esgana-Cão, Folgasão, Malvasia, Rabigato, Verdelho, and Viosinho. While Porto produced in Portugal is strictly regulated by the Instituto do Vinho do Porto, many wines in the U.S. use the above names but do not conform to the same standards. Thus each genuine port style has a corresponding, often very different, style that can be found in wines made outside Portugal. There is a unique body of English ritual and etiquette surrounding the consumption of port, stemming from British naval custom. If the port becomes forestalled at some point, it is considered poor form to ask for the decanter directly. Instead, the person seeking a refill would ask of the person who has the bottle: "do you know the bishop of Gloucester?" (or some other English town). If the person being thus queried does not know the ritual (and so replies in the negative), the querent will remark "He's an awfully nice fellow, but he never remembers to pass the port". In other old English traditions when port is decantered, commonly at the dining table, the whole bottle should be finished in one sitting by the diners, and the table should not be vacated until this is done. Producers of port wine are often called "shippers". In the early history of the port wine trade, many of the most powerful shipping families were English. Over the years Portuguese, as well as Dutch, German and Scottish-owned shippers have also become prevalent in the port industry. A small house who until recently purchased all of it's grapes from independant growers. In 1991 however Burmester purchased approximately 100 acres of vines at Nova de Nossa which now provides upto 30% of their grape requirements. Although Burmester produce a full range of Port Types, their main focus is in Aged Tawnies. Calem are one of the Portuguese producers. They own around eight farms in total providing 10% of their wine. Most of the wines are produced for early drinking. Churchill's are a newcomer to the Port trade, having only being established in 1981 by John Graham following his departure from Cockburn's. Although a new producer the wines are highly regarded, especially the 1985 Full Vintage. Cockburns produces exceptionally large amounts of medium quality Port, with the occasional top quality Full Vintage and Single Quinta wines. As a result of the large volumes produced they are perhaps the market leader in the United Kingdom. Croft is one of the oldest houses in the trade, and has since developed markets throughout the world, especially Europe and the United States. Croft produces a considerable quantity of Port achieving reliable and consistent wines designed for early drinking. Quinta do Roeda, their own vineyard produces a good single quinta wine. Founded by George Delaforce in 1868 the house has since undergone many take-overs and is currently part of IDV. All of the wines are bought in, though a Single Quinta wine is sometimes made exclusively from wines from, and marketed under the name of, Qunita da Corte. And along with earlier (pre-1975) Full Vintages the Quinta da Corte wines offer excellent value for money. The name Dow's came in to existence in 1877 when James Dow became a partner in the company. Offering a full range of wines, all of which are at least good and often excellent. The 'jewel in the crown' is the Quinta do Bomfim vineyard which was purchased in 1890. Dow's wines are made in a drier style which is not to everyone's taste, but have magnificent ageing potential (and they do need to be aged in order to appreciate their real potential). General opinion agrees that Dow's wines are classics of the Port industry. Midnight is a dark rich and full bodied Port blended from a selection of very fine wines drawn from Dow's own Upper Douro vineyards. Trademark is blended to give a full bodied classic Port in the traditional style. Trademark has a slightly drier finish which is the hallmark of Dow's Ports. Wines worth looking out for are, in addition to the obvious Full Vintages, 10 or 20 year old Tawnies, and Quinta do Bomfim, (though any Dow's wine is a pleasure to drink). Ferreira, although not necessarily widely know in the UK, are one of the top Port houses with substantial vineyard holdings. Well made, early maturing Vintages, the 10 year old 'Quinta do Porto' Tawny, and the 20 year old 'Duque de Braganca' Tawny are certainly worth searching for. And perhaps less well known is that Ferreira produce some of the top (non-fortified) table wines as well. Despite being a Portuguese house, Fonseca produce wines in a definetly 'English' style, being huge well structured Ports. Grapes from their 3 'A' class vineyards, (Quinta do Panascal, Quinta Santo Antonio, and Quinta Cruzeiro) are still trodden by foot at Cruzeiro. The 1966, 1970 and 1977 vintages are outstanding, and must surely be part of any serious port cellar. Established in 1797 Gould Campbell are now owned by the ubiquotous Symington Group, and are overshadowed by the other 'bigger' names in the group. This is good news for Port drinkers because it means that Gould Campbell does not attract the premium prices of the others, and are therefore excellent value for money. The 1983, 1985 and 1991 Full Vintages are big concentrated mouthfulls of plum fruit with great ageing potential. An usual story - Graham's originally was a Scottish textile trading business, which came into the wine trade by trading some bad debts for pipes of port. Graham's produces rich and sweet wines with good length of finish. The Single Quinta wine, Malvedos which is still trodden by foot, is produced in lesser years and is unsurprisingly a big seller. For everyday drinking I regularly enjoy, and would recommend to others, Graham's Six Grapes premium Ruby. Kopke is the oldest Port house still in existance. Not widely distributed outside Europe (and not even readily available in Europe) the wines receive high praise in competition and are as such a true connoisseurs Port. Martinez produce a limited range of good quality wines of a sweeter and nuttier style. The Tawnies and recent Full Vintage declarations are worth cellaring. A Port house established in the mid-1800's, the existing philosophy combines organic farming with traditional treading by foot to produce subtle but well balanced wines, notably aged Tawnies, LBV's and Colheita's. Noval is truly a legendary house. Noval have always been leading edge producers and have been responsible for many developments over the centuries, including terracing; the maturing of the wines at the estate rather than at Vila Nova; and even experimenting with mechanical treaders. - Quinta do Noval 'Nacional' made from rare, ungrafted vines which are grown in the oldest parts of the vineyard. 'Ordinary' Quinta do Noval is exceptionally good and commands very high prices, but the 'Nacional' which is ruthlessly sought out by, and highly revered by the true Port cognoscenti, commands statospheric prices. Best known for their 'Boa Vista' Vintage and LBV offerings, the company also makes good quality Tawnies, the finest of which carry the 'Baron de Forrester' name. Some of the Vintage declarations can be insubstantial and uninspiring, so check the Ratings guide before buying. Quarles Harris are one of the oldest Port shippers, but as they don't own any vineyards they have to buy in all of their grapes. On the positive side though because they are not one of the major names the prices tend to be extremely good value for money. They have declared some rather good Vintages in the past, notably 1985, 1991 and 1994. Ramos Pinto was originally founded with the sole aim of exporting to Latin America, but has developed into one of the largest vineyard owners. Ramos forté is their Tawnies and Premium Ruby, and although they do declare Full Vintages they do not reach the quality and impact of other houses. The Ervamoira and Bom Retiro Tawnies are sublime and well worth buying. Royal Oporto grew enormously after 1950, but in the revolution of 1974 it was nationalised and the stocks sold off. The company has since been sold back into private ownership but is still dogged by controversy. Cheap wines that are useful for general, everyday drinking but nothing more. Rozes is singularly unusual in that it is the only Port house founded by the French (which is slightly ironic in that the French are nowadays one of the biggest consumers of Port). Although the company owns one of the oldest vineyards, Quinta do Monsul, it only contributes a very small quantity to the total output, with the majority being bought in from other top vineyards. The wines are lighter and more elegant than the average, and well balanced. The house was founded in 1790 by a Perth (Scotland) exporter George Sandeman and quite rapidly became a major name in Port, but although the be-hatted 'Don' silhouette logo is well known the house itself producers only average wines. The wines are youthful and early to mature, and should be drunk with gusto. Founded by an English MP, Christopher Smith, Smith Woodhouse was acquired early in the 20th century by Graham's, though Smith Woodhouse continues to independantly produce some excellent wines. The traditional Late Bottled Vintage wines are bottled without filtering and will mature further in bottle. Perhaps not to everyone's liking they are, like Warre's, of the slightly drier style, and usually have great ageing potential. The Vintages are concentrated and powerful. Although branded "Taylor's" the company is actually Taylor, Fladgate and Yeatman. Taylor's produce the full range of wines, which includes the excellent First Estate premium ruby, rich tawnies, excellent LBV's and excellent Full Vintages. The hallmark of Taylor's is great depth, but with structure and really concentrated fruit flavours, which ultimately produces very long lived wines that need cellaring. The Vintage wines are mainly based around the Vargellas vineyard, but some grapes are bought in from top quality suppliers. Warre's is the oldest Port house, and has been a major force in the Port trade ever since. They were instrumental in organising the British shippers, and designing and implementing the Factory House. The main vineyard and pride of Warre's is Quinta da Cavadinha (which in translation means "well-tilled"). Bought in 1980 it produces around 10,300 cases of very high quality Port every year from it's 40 hectares. Warre's produce some of the best wines, from ruby, to tawny, LBV and Full Vintage. Their style is usually drier than their competitors, but still has excellent flavour, depth and balance. Perhaps Warre's is a matter of taste, some like the style, some prefer others. Either way if you have some in stock, you or your friends, will seldom be disappointed. Quinta da Cavadinha : 1979, 1982, 1987. 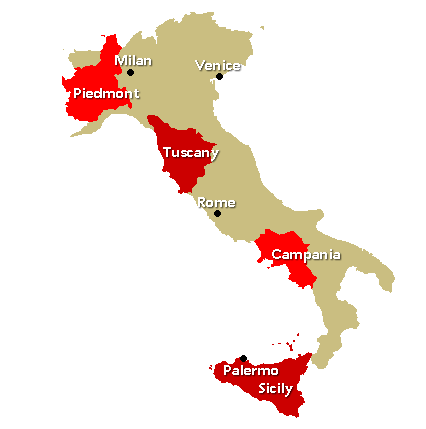 Piedmont and Tuscany are the regions where vintages most matter, and where the wines most repay ageing, especially Barolo and Barbaresco from Piedmont and Chianti Classico and Brunello di Montalcino from Tuscany. This is not to say that other Italian reds do not improve with age; most whites however are best drunk in early youth. 1961 Good In Tuscany great in Piedmont. 1970 good vintage in Tuscany very good in Piedmont. 1974 Excellent vintage in Piedmont, good elsewhere. 1978 Best vintage of decade. 1989 Mixed vintage, Brunello the best. 1990 A uniformly excellent vintage throughout the country; the wines will repay further ageing. 1991 A great vintage in both Tuscany and Piedmont. 1993 Average quality in Tuscany, and only little better further north in Piedmont. 1994 Tuscany fared better this year, but rain at the harvest nevertheless diluted the quality. 1995 Some great wines were made this year in both Tuscany and Piedmont. 1996 Fine in Piedmont, and above average in Tuscany. 1997 An excellent vintage throughout the country. 1998 Successful in both Tuscany and Piedmont. 1999 The hat-trick vintage, with fine wines in both regions. 2000 Yet another very good vintage in Piedmont, and a good but less uniform year in Tuscany.